VSoft Technologies has recently announced its plans offsetting-up a Software Development Centre in Mangalagiri, Andhra Pradesh. This Software Development Centre at Mangalagiri would helpto scale company’s operations by providing innovative technology solutions and services to its Financial Institution clients that are based in India and Abroad. This center would also be used for Banking Software Development and Support Activities. The proposed development center will be set up in 1882 sq. feet area that has been allocated as per the industry policies framed by the Government of Andhra Pradesh. VSoft Technologies, which commenced its operations 20 Years ago, has a Development Center in United States and provides services to more than 2600 customers globally. In India, the company has head office & development centre in Hyderabad and Rajahmundry respectively and serves over 300 customers. VSoft’s next-generation, platform-based BFSI business services help banking, financial and insurance service providers to adapt, innovate and compete with greater speed and rigor. The company has built a comprehensive platform BPO infrastructure where people, process and technology work in unison to drive, support and accelerate business transformation. Speaking at the occasion, Murthy Veeraghanta, Chairman and CEO, VSoft Technologies, said “We are delighted to set-up this World Class Centreand within a year the tremendous talent in Mangalgiri and across the state of Andhra Pradesh will help us to achieve our goals not only in India but also across Asia ,Africa and the Americas. We are also committed to create more than 400 jobs at the centerthat are going to be the backboneto our growth strategy”. 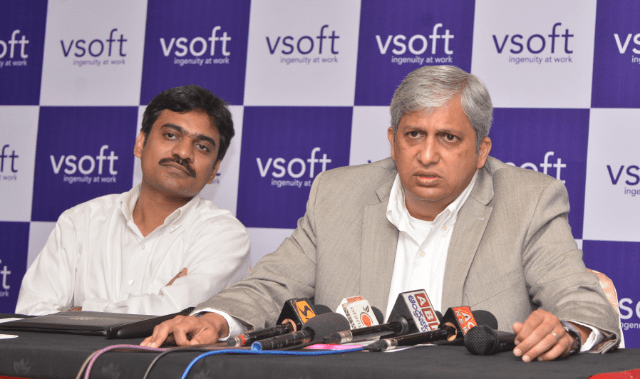 VSoft Technologies to set-up its Software Development Centre in Mangalagiri 0 out of 5 based on 0 ratings. 0 user reviews. May I know the current vacancies for 2016 btech CSE Fresher’s? Is there any openings MBA 6+ years experienced ?